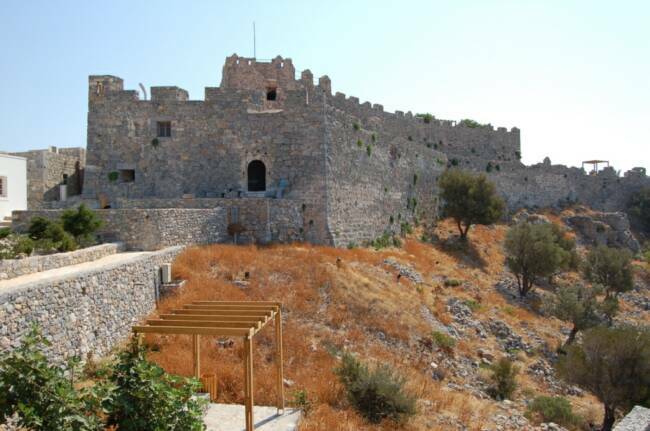 Leros strategic position in the southeast Aegean has given a rich past in history. The first human traces on the island have been detected at Partheni and belong to the Neolithic period. This was an entire settlement and it has been dated from 8000 to 3000 B.C.. Carian, Leleges, Phoenicians and Cretans (led by Radamanthys, the brother of King Minos), were its first inhabitants. In their tempestuous descent the Dorians reached Leros and conquered it. Homer has it taking part in the Trojan War along with Kalymnos and later the historian Herodotus mentions that it developed close political, intellectual and commercial ties with the Ionians of Miletos. During the 5th century Leros flowered intellectually. That was the period of the satirical poet Dimodikos and the historian Pherekydes. After the Persian Wars Leros became part of the Athenian Alliance. The forces of Alexander the Great also passed through Leros. This is confirmed by funerary steles and coins from that period were found on the island. Plutarch also notes its important location for shipping, referring to the captivity of Julius Caesar on the island of Farmako next to Leros. During Byzantine times magnificent Christian churches were built on the island. Constantine the Great incorporated Leros into the Theme of Samos. During that period the castle and the Church of the Panayia (The blessed Virgin) were built as well as the Castle of the Lepides, known today as Paliokastro. So-called "Cyclopean" walls have survived in the area. There are exceptional Byzantine monuments on the island such as the Early Christian church at Partheni, the church of Ayia Varvara (St. Barbara), built with sections of marble, column capitals, stone slabs and other materials from the ruins of ancient Leros found there. In Alinda, as elsewhere, "tholaria" have been found, that is, small domed dwellings dug into the slopes of hills, where monks once took refuge. In 1314 Leros was occupied by the Knights of St. John of Rhodes and they governed it tyrannically until 1523 when the Turks took command of the entire Aegean and plundered the islands. Despite the difficult conditions of the Turkish occupation Leros did manage to preserve a kind of autonomy and later when the Greek Revolution of 1821 broke out Lerians were some of the first to rise up. In 1830 all the Dodecanese were ceded to Turkey by the London Protocol in exchange for Euboea. Then, during the period 1912-1943, it was taken over by the Italians. The whole island was turned into an arsenal. Important defensive works were carried out and military installations built with the idea of turning Leros into an Italian naval base. A new town was created at Lakki. Many buildings were pulled down in order that new ones could be built in their place, with an architecture unique in all of Europe at that time. During World War Two, the Greek "Sacred Battalion" liberated Leros after the Italian capitulation. This was followed by two years of English occupation and then in March, 1948, Leros, along with the rest of the Dodecanese, was united with Greece.